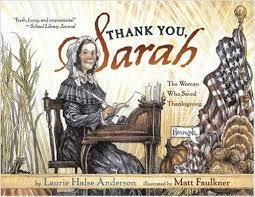 There is a great childrens book about Sarah entitled, Thank You Sarah: The Woman Who Saved Thanksgiving by Laurie Halse Anderson, and beautifully illustrated by Matt Faulkner. It's geared towards 4 - 8, but the writing is entertaining (and informative) for adults as well! You can learn more about Thank You Sarah at Laurie Halse Anderson's website. As I stream the Macy's Thanksgiving parade on Roku and get my sweet potatoes in the water, I want to wish everyone a Happy Thanksgiving! I hope ya'll are sharing this day with family, friends and great food! Gobble, gobble!